Travel on a Shoestring is giving away Two (2) free subscriptions for six months each to Breakfast Magazine. Look how nice the magazine is! The texture, content and every page of Breakfast Magazine have substance. 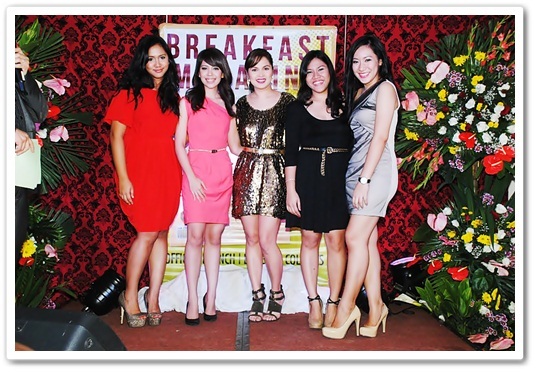 I always admire these young ladies behind Breakfast Magazine especially Alexis (2nd from the left on the picture below). She has already accomplished more than what many people twice her age had accomplished. Imagine at such a young age. (Yes, she is 20 years old), she is already the Breakfast Magazine's Editor-in-Chief. Keep rocking, Alexis! For our rainy days giveaway, we will have Two (2) [yes, not one(1) but Two(2) winners of six-months subscription each to Breakfast Magazine! Yehey! This is for Philippine residents only. So get ready and join the fun! Please Note that it is mandatory to follow each of the tasks in the Rafflecopter. Please carefully follow the instructions stated at the rafflecopter. Failure to comply will lead to forfeiture of your prizes. The winner will be selected at random from all entries received.Should this forfeiture occur, a new winner will be selected based on the contest criteria as stated above. I hope to win! Thanks for this! I love reading magazines. And I want Breakfast Magazine to be one of the magazines that included on my daily routine every morning. Can't leave home without breakfast. And I love food mags. Wow! Editor in chief at 20y/o!!!! hOPE TO WIN:)i love it! Hi~! I just jOined your giveaway~! I'm a food lover despite that I don't eat out a lot. I would like to Win so I'll have Breakfast Magazine subscription for free! I've read Breakfast Mag every now and then. I like it's concept and the topics that are featured on every article. I hope to win so I can religiously read every issue of the mag :) <3 Thanks much dear for the giveaway! would love to win Breakfast Magazine! !